Comicsy is delighted to announce we’ve teamed up with self-publishing experts Blurb to help UK comic and book collectors publish their own work. Whatever type of book you’re interested in publishing Blurb offer a high quality print service, whether you’re a first-time book maker or an experienced pro, Blurb makes it simple to make high-quality books that do your stories and your photos proud. The comics industry is an extremely hard nut to crack. Even if you’re lucky enough to get in to Diamond you’ll quickly see any profits vanish in to thin air (Link: The Reality of Mainstream Creator-Owned Comics). The arrival of the internet has opened up a whole host of possibilities for publishing your own work. The arrival of the social networks now means you can reach out to your audience and potential new customers at the click of a button. Self-publishing is now seen as a credible method of generating revenue, developing your brand, and growing your audience. Blurb is a creative publishing platform that unleashes the creative genius inside everyone. Blurb’s platform makes it easy to design, publish, market and sell professional-quality books. Blurb’s bookstore and online marketing tools enable customers to market and sell their books, and keep 100% of the profit. Blurb’s social and community features allow customers to create and share Blurb books among friends and colleagues with ease. More than photo books. In addition to photo books, the product range extends to notebooks, cookbooks, weekly diaries, novels, Facebook photo books, Instagram books and more. Books start from just £1.75. 500+ ways to customise your book. Personalise your book with a huge range of paper types, cover options, endsheets, templates and books that go up to 440 pages (that’s 300 more pages than the other guys). Free Design tools – no matter what your skill set. Select your design tool – Blurb Bookify™ for easy online bookmaking, Blurb’s award-winning BookSmart® programme or Blurb’s PDF to Book workflow for the pros. Sell your book. 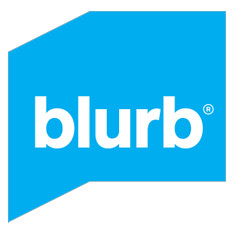 Sell your printed books and ebooks in Blurb’s online bookstore keeping 100% of the profit. Make books. Make a profit. No strings. No really, that’s it. You set the price of your printed book, PDFs and ebooks, and when you make a sale, Blurb send you the profits. Make a book using any of our book-making tools and upload it. Purchase a copy for yourself in the formats in which you want to sell your book (printed book / ebook). Sign up to our free Set Your Price programme. It only takes a few minutes. Decide how much profit you want to make per copy. Earn money when people buy your book: you keep 100% of your markup for a print book or PDF, or 80% of the price you set for an ebook. Don’t forget, Blurb also helps you submit your ebook for sale on the Apple iBookstore so you can reach an even larger audience. You keep 50% of profits from a sale via Apple. 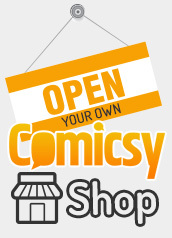 Show your support for Comicsy by switching to Blurb for all your book publishing needs. Before you sign up for Blurb, click on one of the banners above and Comicsy gets a share of the value of whatever you purchase from Blurb, at no extra expense to yourself.